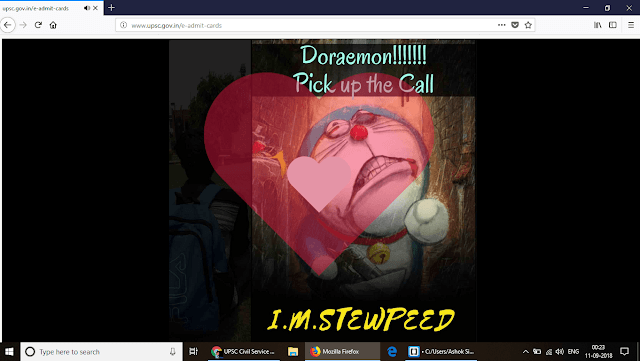 Union Public Service Commission (UPSC) website hacked by someone and hacker placed Doraemon picture as the front page of the website. Union Public Service Commission's(UPSC) website hacked by someone. When we visit UPSC website at 12:15am on 11th September 2018 found that someone hacked UPSC website. On the front page of UPSC web portal, Doraemon picture placed and a background song "Zindagi swaar doon, ik nayi bahar doon" Snapshot of the website provided above. As you can see, wounded Doraemon placed as wallpaper of the website, look at its eyes and shape. Also, He's having a gun in his "gadget box". To avoid such kind of incident, UPSC must run its web portal on a secure server. At present, UPSC website running on non-secure i.e. HTTP server where HTTPS server is safe and secure. UPSC should think on this. Hacker also prefix www before UPSC portal. Later at 12:37 am, 11 September 2018. website retrieved by UPSC. And at near 12:44am UPSC again lost control over the website. By morning, for a while UPSC able to get control over its website but again lost it. Sometime UPSC official page can be seen at upsc.gov.in and after a moments Doraemon. Later website was under maintenance for almost 18 hours. And Now, UPSC website is stable.